Quick lunch today! 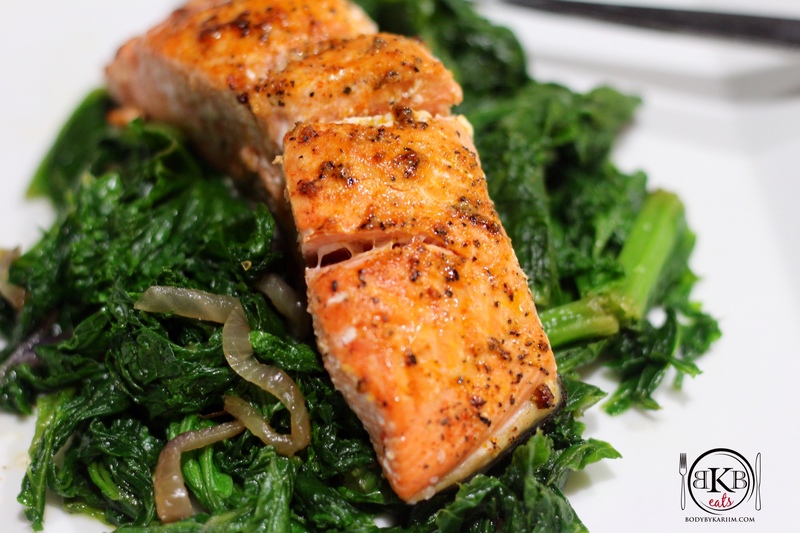 We paired our broiled salmon with sautéed mustard greens and sliced avocado (not pictured). Mustard greens are low calorie and nutrient- packed. They share the same cancer fighting properties as kale and have high levels of health boosting antioxidants & vitamin C.
In a large skillet over low heat, warm olive oil. Add the onion and 1/4 teaspoon of sea salt, stir and cover. Continue to cook, stirring every 5 5minutes or so until onions are soft. Meanwhile, preheat oven to broil and prep fish. Coat salmon with olive oil and sprinkle the remaining salt plus pepper to the salmon. Evenly on both sides. After the onions have been cooking for about 15 minutes, place the salmon in the oven and broil for 5-7 minutes, depending on the thickness of the fillets. KEEP AN EYE ON IT. You want to remove once the salmon starts to crisp and brown. Once the salmon is done remove from oven and sit aside. When onions are soft, add 1 cup of mustard greens and stir until wilted. Plate and serve to your liking. We added sliced avocado to the side. Half for each of us.